If you’re using fresh spinach, it can be a bit of a pain to make this meal, as you need to use enough leaves and let them wilt in the pan before you can go ahead with the cheese and eggs. However, recently I came across a brilliant invention: frozen chopped spinach in “nuggets.” The spinach is simply packed into small cylinders in a bag, so you only use the amount you need. This packaging option is so useful when you’re cooking a smaller dish that calls for less than a full package of chopped spinach (and especially when you live alone, like me!). I use it in my green smoothies, and I use it for this scramble! 1. Heat a dash of olive oil over medium-low heat in a frying pan. 2. If you are using fresh spinach, wash the leaves and pat them dry. You may wish to chop them into smaller slices, but leaving the leaves whole is fine. If you are using frozen spinach, allow it to defrost (2-3 minutes using your microwave’s defrost setting should do it). 3. When the oil is hot, add the spinach and allow it to wilt and heat up. Turn the heat down to low, then add the feta and allow it to melt slightly, about 2 minutes. 4. In a bowl, scramble the eggs. Add a bit of water if desired to make the eggs a bit fluffier. Keep in mind though that the spinach will release water as well. 5. 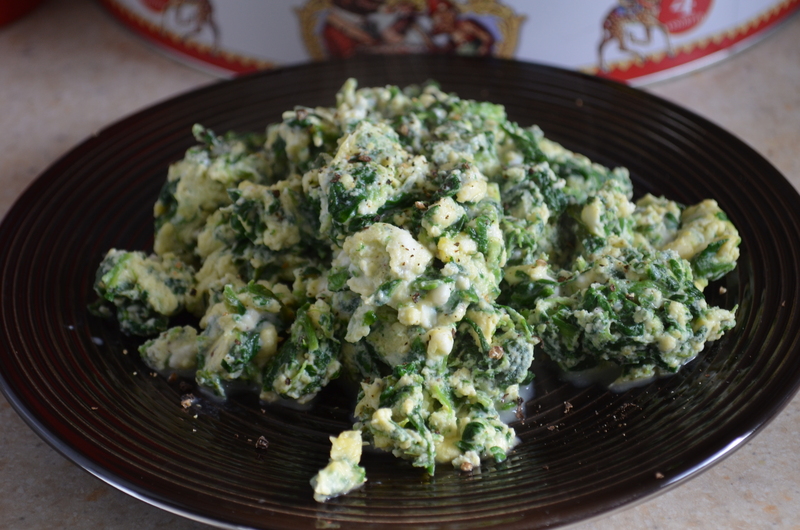 Once the feta has partially melted, pour the eggs over the spinach mixture and let it sit for a moment. Sprinkle a hint of ground nutmeg, salt, and freshly cracked pepper over the eggs. Then, begin to scrape the eggs off the sides of the pan and folding them towards the centre using a soft spatula. Repeat every 30 seconds, until the eggs set. Turn the heat up to medium-high and allow any extra liquid to evaporate before serving. Be sure to continue stirring the eggs at this step to prevent them from burning or overcooking. 6. Serve alone or with toast! This entry was posted in Breakfast and Brunch, Eggs, Greens, Quick Meals, Vegetarian and tagged cheese, easy, eggs, feta, greens, quick, spinach, vegetarian by laratboulos. Bookmark the permalink.